I looked around Sunday and, besides seeing the usual clutter, I realized we were each absorbed in a craft of some sort. This used to not be unusual for a weekend, but I haven't noticed it in a while. Maybe my son does that sort of thing less now that he can "hang out" with friends via online games. Yet, when we all get crafty, with good music playing in the background, (yesterday it was The Clash) we are all refreshed afterward. Join me for the tour. 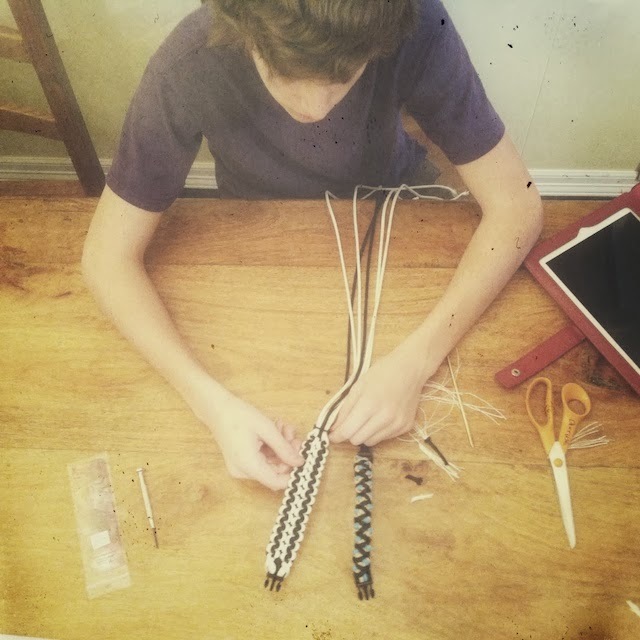 In the kitchen we have my son, hurriedly making a paracord bracelet before a friend picks him up. He should be packing, but keeps saying, "I'm almoooost done." That sounds familiar. 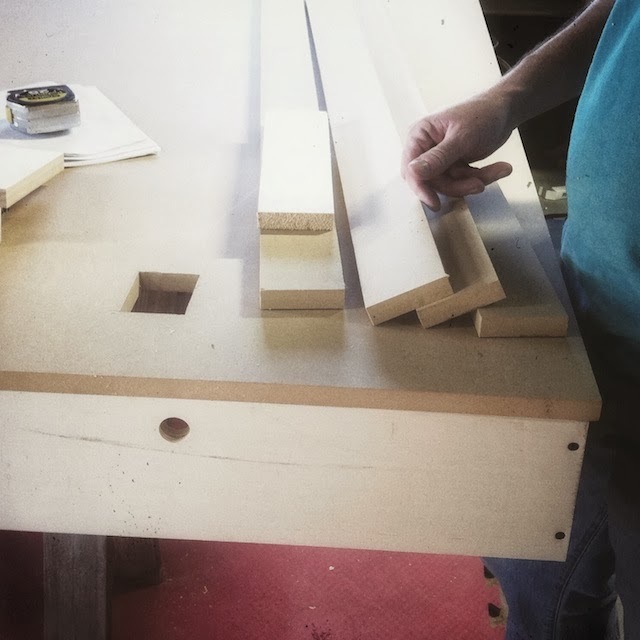 That racket in the garage is my husband cutting wood and installing legs on the murphy bed he is finally finding the time to make for the aforementioned long and lanky boy. I look at how this bed is coming together and think what people who look at a finished sweater often say: "I wouldn't even know where to start." This will not only give my son a larger bed, but give me competition on who the little dog will sleep with, since my son won't be in a loft bed anymore. He'll have more floorspace now in his tiny bedroom. It really shouldn't be a bedroom. It would make a good extended living space, and, with a murphy bed, can be one day. 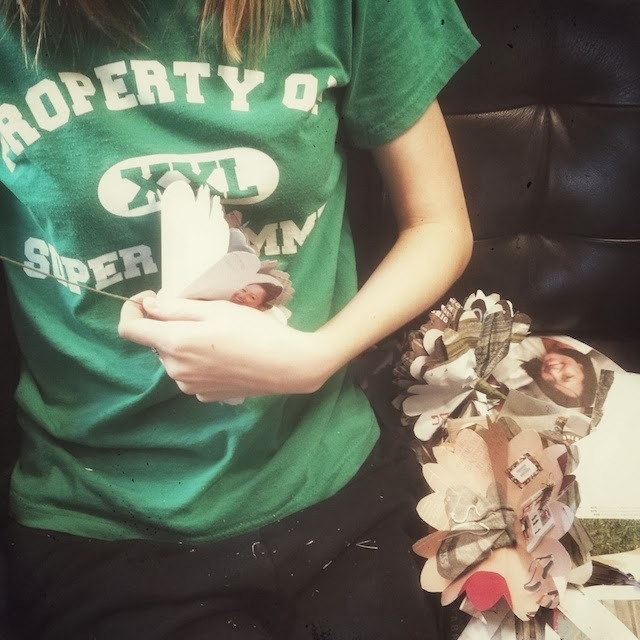 Speaking of living rooms, my daughter has taken ours over with pieces of Tom's catalog pages she's using to make paper flowers for a friend's dorm. They really do make nice, softly colored leaves. I'm next to her, knitting away on Antrorse, where my yarn strands compete with her paper scraps as clutter. I've changed my mind twice about my size on this one. Moving from one strand of worsted and a size 34" to two held together and a size 32". I did try it on today and I think I've finally got it right. Because my doubled strands are a bit larger than the Aran the pattern calls for, my 32 is more of a 34". The Pampas Heather Wool of the Andes is growing on me. Initially, I thought it was a safe color for me, but a bit boring. But I wanted this sweater to be light colored to show off the texture and super wearable, and green is my color. I find I love it more and more as I work on it. It's like that faded, fatigue colored t-shirt I loved from way back when. Instant favorite. I loved making the one row button holes. I've never done that before. There are three button holes and I think I made each of my family members watch me do one. Surprisingly, they were actually impressed by the magic, too. Heheheh...that one row buttonhole is my FAVE! and so addicting! I think I spent a week just researching buttonholes when I designed this sweater! So glad you're making one and I CANNOT wait to see it on you! Yea! Antrorse! I thought those buttonholes were gorgeous and some of the neatest ones I've ever done on a garment. Loved them. Must alter all future buttonholes in patterns to be like those. You all are such a crafty bunch! That's awesome! This pattern is really growing on me. I wasn't initially drawn to it because of the color, but thanks to Ravelry I've been able to view it in colors that appeal to me it's made it to me queue. I'm really drawn to heathered colors. How's the WOTA next to your skin? I made Harry Potter sweaters for my boys and they complain that where it touches their necks is itchy. I'm going to had to line the necks. It's so nice when the family crafts together. Koen likes to sharpen his cut-throat razors while I knit or sew. It makes you feel at peace. Hey, Julieanne, I just read your notes on ravelry. Did I read correctly? Was this your first sweater?! How cool for a first. I have started over since posting this. I always have gauge issues. My wrists want to knit ever-more-loosely, and my gauge seems good until I actually put it on and it's stretchier than I realized. I have dropped down three needle sizes, so it should be okay. But, yeah, it's icy outside here and I really wanted to wear this! 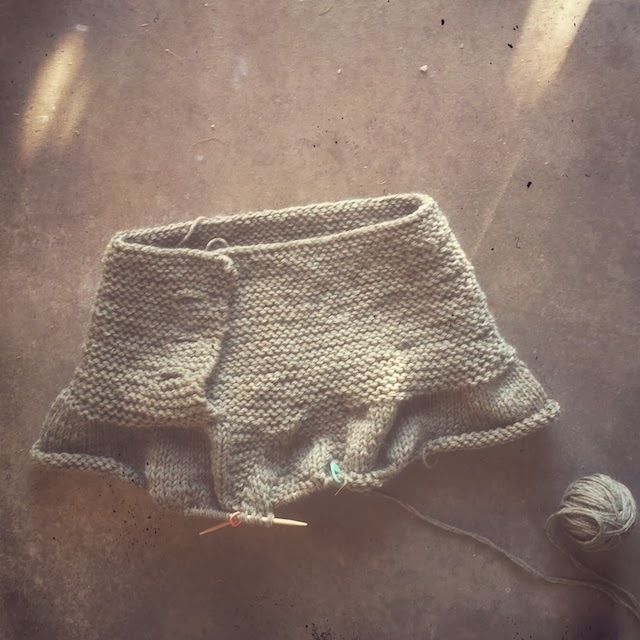 I love the finished product when I'm knitting, but it's extra special when I learn something new or use a fun technique to get there. I can't wait to see this completed! I don't have a problem with scratchy wool, but I know lots of people do. My son wouldn't like it next to his skin either. I don't find it unusually itchy, but WotA is worsted and this calls for a full Aran. Doubling my strands has helped make it more substantial, but it's giving me gauge issues. And it's pretty thick. I've dropped it down to a size US 3 needle and so far, so good. I really wanted my Antrorse in the exact color as the pattern sample, but I thought it wouldn't look so great with my skin, etc, so I tried to pick a light color that I think will compliment it more. I don't always worry about stuff like that, but I want this to be worn for a long time, so I made the effort to keep it my kind of classic sweater. I agree. Crafting, playing board games, or walking the dog are favorite of mine. The kids seem to open up and really communicate with me when walking. I also love it when we camp and come back from some strenuous event, put food over the fire and all collapse into hammocks, lawn chairs and read. It does feel peaceful. You look way too young to have teenagers! I hope my girl is into craft things as she gets older. I really like the colour you chose, or at least, the colour I see on my screen! That is going to be a gorgeous sweater. Thanks, Heather! I think the fit is finally right. I tried the body on last night and, with blocking, I think I'll have the extra ease I needed. Shannon, I was wondering if you could give me some help with the Antrorse pattern? I keep stuffing up joining the collar together, at the start of the Yoke instructions. I can see how its supposed to end up, i just cant get it there! Hey, lapetite, I'm not sure if Shannon will see your request here. You might try her contact info on http://www.luvinthemommyhood.com or if you are on Ravelry, the VeryShannon group forum will have lots of knitters ready to chat about it. If you're not on Ravelry yet, join! You'll love it. 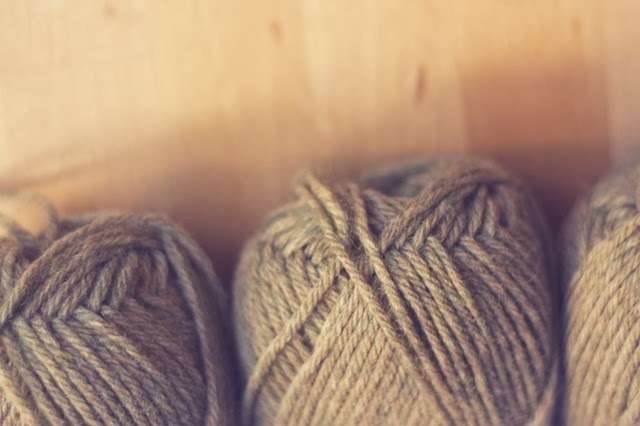 I can say that what you're doing on that first yoke round is ignoring the first few sts, that are on a holder, and joining your yarn just after them to knit in the round. 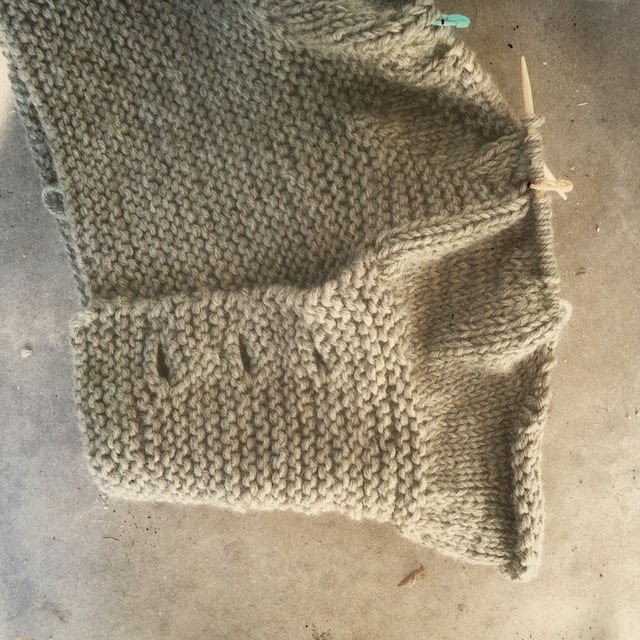 Then, when you're to the last few sts of that round, you'll take them off of the holder and knit each one together with its corresponding stitch from off of the needles in front of it, so that the last few sts overlap with the first few. Hope this helps!